Atlantic County residents who receive recycling collection from ACUA are entitled to one free 20-gallon recycling bucket per calendar year to use for curbside recycling collection. Atlantic City, Corbin City, Dennis Township, Galloway, Port Republic and Woodbine residents are not eligible. Residents residing in apartment buildings are not eligible. Request your bucket online. Additional buckets can be purchased for $10 at our Environmental Park Geo Building. 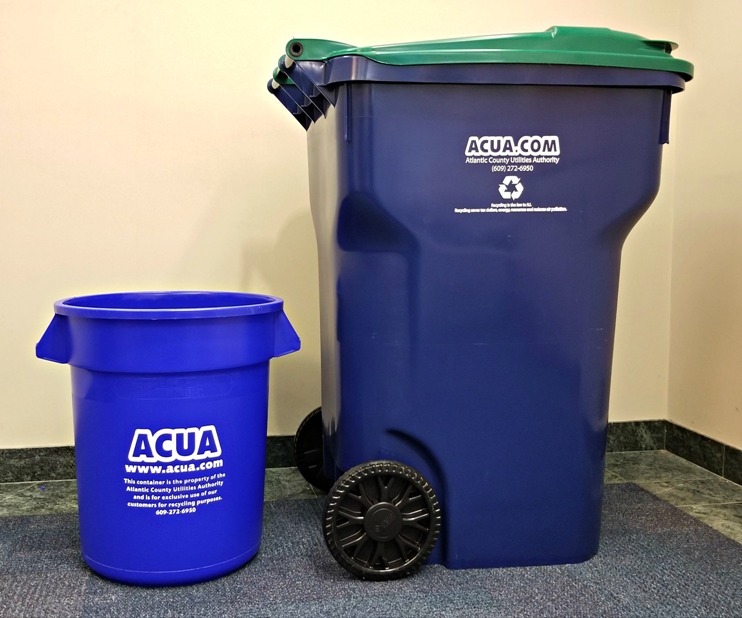 ACUA offers 95-gallon recycling carts for households who want extra space to hold their recyclables. The recycling carts are available for $75 each. Carts can be ordered online and delivered to your Atlantic County residence at no extra cost. Please note, recycling carts cannot be used in Atlantic City, Galloway or Port Republic. Recycling carts cannot be delivered to Dennis Township. Any Container with ACUA Stickers! Residents can use any household container they have available, such as a box or a trash can (no plastic bags! ), to use for curbside collection as long as there is an ACUA sticker affixed to the side of the container to identify it as recyclables. Request stickers online. Sturdy, 95-gallon trash carts are available for purchase for $75 each through our online store and can be delivered to your Atlantic County residence at no extra cost. Please note, trash carts cannot be used in Atlantic City, Egg Harbor Township, Galloway, Hamilton Township, Hammonton, Mullica Township or Port Republic.